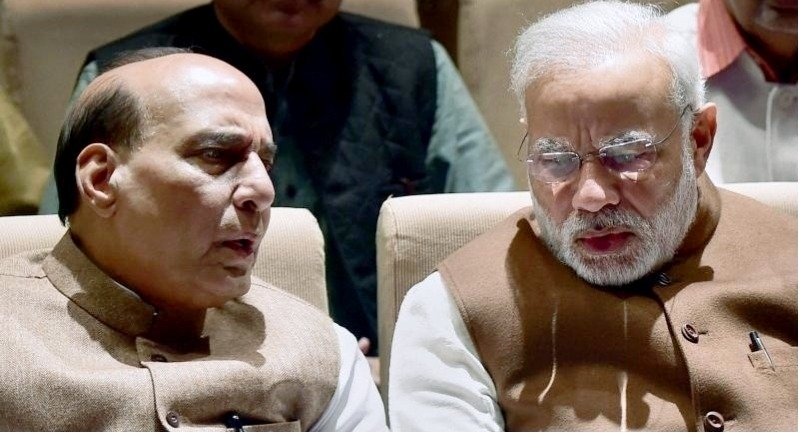 New Delhi, June 16: Prime Minister Narendra Modi and Friday night held a meeting with Home Minister Rajnath Singh in a bid to review the security situation in Jammu and Kashmir. Notably, the meeting comes a day before Eid festival when a month-long conditional ceasefire in the valley is to end. The meeting held at the Prime Minister’s residence lasted about 40 minutes was also attended by National Security Advisor (NSA) Ajit Doval. During the meeting, Minister Rajnath Singh gave a detailed briefing to PM Modi on the situation prevailing in Jammu and Kashmir with particular reference to recent spurt in violence including attacks on security forces in the Valley. On Thursday, Home Minister Rajnath Singh met top brass of Ministry of Home Affairs, CRPF and J&K officials to review security stock of Jammu and Kashmir. He also visited Jammu and Kashmir on June 7 and 8 and himself reviewed the security situation including post-conditional ceasefire situation with top officers of all security and Intelligence agencies, operating in the State to gather feedback of ceasefire impact. Looking at the holy month of Ramzan and Amarnath Yatra, Home Minister Rajnath Singh announced a conditional ceasefire to stop anti-terror operation on May 16 this year on the plea of Jammu and Kashmir’s CM Mehbooba Mufti. The valley has witnessed the killings of over 55 militants and the deaths of 27 locals this year.